When you head off on a cycling holiday, the last thing you think you’ll be doing is riding home from a night out at 4am. That’s the time you usually get up on these things, eating porridge with your eyes closed and out the door in time for the sunrise. Not in Vienna. Things are far more cosmopolitan here, and you really wouldn’t want to miss the nightlife just to get up before the birds for an early ride - far better to be serenaded to sleep by them. Cycling in Vienna is pleasurable at the best of times, but in those hours when the civilised world is soundly asleep and you share the streets with only the creatures of the night and a few bedraggled revellers, it becomes something else entirely. This was, to be clear, far from the culmination of an evening of wanton abandonment - it just seems to be the way they do things in Vienna. You eat at about 9pm-ish, hang out around some bars for a few hours and then party a bit. Our visit coincided with a month-long festival of dance in the city, which probably enhanced the whole experience, and the Vestibule venue was still throbbing to the deep bassline of hip hop and grime when we left. Vienna has recently been crowned the world’s most liveable city by an Economist survey, and from a bicycle it is easy to see why. The ease with which one can navigate the place using endless miles of segregated cycle path make getting around by bike one of the more obvious forms of transport. But even when forced to share the road it is a far less terrifying experience than, say, London. There are fewer vehicles, period, and the pace of life appears altogether more laidback. People generally are more civil to each other and drivers aren’t intent on running you off the road. When exploring the city by bike, it still pays to take a lock, even if bikes don’t tend to get stolen. They still get ‘borrowed’ by those who might be looking for a quick hop around town. Fun as it is to ride around town, the real cycling lies beyond the city. Even from the centre, the modestly named Vienna Woods are only a 15-20 minute ride away, and open up a playground of perfect climbs that wind up through thick forest along pristine tarmac. The gradients are challenging enough but never too painful and the distances on just the right side of pleasurable. These are nursery slopes compared to the mountains you’ll find further west and the Woods actually form the foothills of the Northern Limestone Alps, which stretch the breadth of the country. Small clues to what lies beyond can be found in these hills - lodges at the crests of climbs and even a chairlift cutting through the trees. You are far from alone on these roads, especially when “chasing sunsets” in the evening. The Woods are a popular destination for tourists and city folk looking for some space, as well as motorcyclists who do their best to take the hairpins at crazy angles to the road and at a pace so slow that if the angle doesn’t get them, gravity will. Everyone loves these roads but they seem almost purpose built for cyclists, to the extent that villages will invariably feature a tap that dispenses drinking water direct from mountain springs, so cold, clear and sweet that you’ll wish you’d brought more bidons. You can spend hours riding through the Woods, up one side of the ridge of peaks and down the other and back again, then round and up another route, all the time marvelling at the sheer splendour of the ancient forests you ride through. You will pass through tiny villages and fill your bottles at many fountains and stop again and again to snap the view and the sun through the trees and the way the dappled sunlight dances on the road and then you will realise that the guys behind Viennese cycle brand BrilliBrilliant/Unicorn weren’t crazy when they told you about the Outdoor Disco in the Woods. If you go due north out of the Vienna Woods, you will find yourself on the banks of the mighty Danube, a river that begins in Germany and winds its way across eastern Europe before depositing itself into the Black Sea off Ukraine. Vienna is built on the banks of the Danube and up here, north of the city, the river plays the part of an inland coastline, its enormous girth aiding the illusion that the packed beaches look out onto an inland sea. As with the city, smooth cycle paths run everywhere, along the banks of the river and all over the 21km long Danube Island. There’s a climb between Danube Island and Vienna that takes you from the river up to Hadersfeld. It’s only two kilometres in length but delivers a significant punch, ticking up to 11 per cent in places and creeping up through thick, creaking woodland so silent that a snapping branch far off the road will send a shiver down your spine. The area around the Danube is indeed a recreational playground and thanks to the cycle paths, returning to Vienna is a simple case of pointing your bike south. One of the nicer access points to the city will have you first passing the financial district and the United Nations buildings before crossing along a cycle track beneath a road bridge. You will pop out in Prater park, once a hunting ground of Emperor Maximilian II in the 1500s and now a vast public space bisected by an enormous riding track and containing a sprawling amusement park at one end. The giant ferris wheel here is a celebrity in its own right, having featured in a number of films including The Third Man (1949) and James Bond’s The Living Daylights (1987). While you’re around this area, it’s worth checking out the architectural treasures of the Campus Prater, or the Sigmund Freud University campus, notably the library with its impossible looking University of Economics Library and Learning Centre, designed by Zaha Hadid. The Prater and the Second District it lives in are the sightseeing side of town. A short ride into the city from the amusement park will find you riding along the tree-lined avenue of Praterstrasse, where you can stop by for a mouth watering cone at Leones Gelato before crossing the Donaukanal and into the first district, with its opera house and museums, palaces and churches. You could spend an entire weekend exploring the narrow streets and marvelling at the baroque architecture and many do. This is a district easily discovered by bike - within a few minutes we had ridden to St Stephen’s cathedral, found Mozart’s apartment and seen the queues waiting to get in, navigated our way between the museums and crossed in front of Hofburg Palace. Vienna has the charm of Paris with the ambience of Amsterdam, a vibrant cafe culture and an incredibly laidback, cosmopolitan attitude that cheers your very soul. Riding back through the city to the Hotel AM Brillantengrund in the Seventh District makes for a nigh-on perfect finale to an afternoon’s riding - and that’s when you’ll be riding here, because you will go back to your beautiful hotel room and shower, then eat and sometime later in the evening you’ll hop on that city bike and take to the same streets again for an equally invigorating experience, but instead of dancing up hills you’ll be doing it on the dancefloor. The Brillantengrund is something of a hidden gem - family run and incredibly welcoming with a restaurant serving Filipino speciality dishes. The Seventh District hotel took its name from the fabrics, known as brilliance, used as a form of currency when the area was the location of Vienna’s silk factories. At that time, the Brillantengrund itself was a monastery. Vienna has vibrant arts and culture scenes and the Brillantengrund regularly hosts events and exhibitions. This, along with the amazing food, has made the hotel a popular destination for the city’s creative and media community. 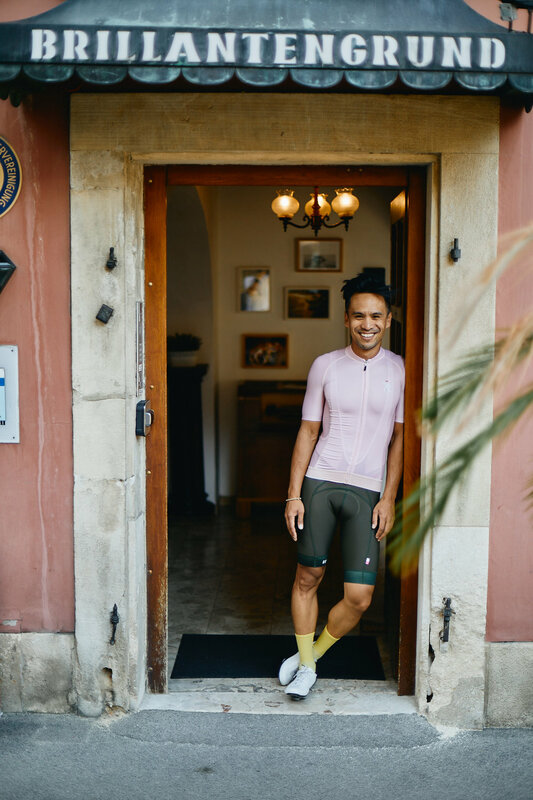 Cycling guests who stay at the hotel are in for a real treat - the Brillantengrund doubles as the headquarters of Viennese cycling brand BrilliBrilliant/Unicorn. Their showroom can be found at the rear of the hotel in the ‘garage’ and club rides are run regularly through the week. BBUC also holds regular Pow Wow weekends, when cyclists can enjoy led rides and also experience the nightlife Vienna has to offer. Visit bbuc.co for more details.